Marvel Anime is a series of four anime television series and two direct-to-video films produced in collaboration between Marvel Entertainment and Japanese animation studio Madhouse. The four twelve-episode series, based on Iron Man, Wolverine, X-Men, and Blade, aired in Japan on Animax between October 2010 and September 2011. An English-language version aired in North America on G4 between July 2011 and April 2012. Each of the series, guided by writer Warren Ellis, largely features Japan as the setting for the storyline. The project took top Marvel characters and reintroduced them for a Japanese audience via four 12-part series; Iron Man, Wolverine, X-Men, and Blade, which aired in Japan on Animax between October 2010 and September 2011. The announcement was confirmed at the 2009 San Diego Comic-Con. According to former Madhouse President and CEO Jungo Maruta, Marvel gave the anime studio free rein to re-imagine the Marvel superheroes for Japanese audiences. English version was premiered in the United States on G4. The series was guided by Warren Ellis. "It will create an entire parallel universe for Marvel," said Simon Philips, president of Marvel International about Marvel Anime. The Marvel Anime series is being aired in Australia on Sci Fi. Iron Man (アイアンマン, Ironman) (DVD title: Iron Man: Animated Series) is the first show of the series with 12 episodes. The series was directed by Yuzo Sato, with Warren Ellis writing the story and Jamie Simone serving as voice director, casting director, and reversion producer for the English version. A special preview ran on Animax on September 25, 2010, before the series began airing on October 1, 2010, and ended on December 17, 2010. While Iron Man premiered in the US on G4 on July 29, 2011, a "sneak peek" of the first episode aired on July 23, 2011 following G4's Comic-Con 2011 Live coverage. The entire series was released on DVD in the United States on April 24, 2012. A follow up direct-to-video film called Iron Man: Rise of Technovore was released on April 16, 2013. Tony Stark goes to Japan to produce a new arc reactor power station and showcase the Iron Man Dio, a new prototype armor, that will replace him when he retires. However, the Iron Man Dio goes out of control and it is up to Tony as Iron Man to stop it along with an organization called the Zodiac. Iron Man even gains an ally in JSDF operative Captain Nagato Sakurai piloting the Ramon Zero armor that his military group made for him. Iron Man soon discovers that his old friend Ho Yinsen (who Tony thought was dead upon his first time as Iron Man) is alive and is operating the Iron Man Dio armor for the Zodiac's goals. Cast of Wolverine, Logan, Mariko Yashida, Shingen Yashida, Kikyo Mikage, and Yukio. 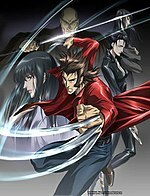 Wolverine (ウルヴァリン, Uruvarin) is the second show of the series with 12 episodes. It aired on Animax between January 7, 2011 and March 25, 2011. While Wolverine premiered in the US on G4 on July 29, 2011, a "sneak peek" of the first episode aired on July 23, 2011 following the Iron Man "sneak peek" and G4's Comic-Con 2011 Live coverage. Jamie Simone served as voice director, casting director, and reversion producer for the English version. Logan learns that his true love, beloved sweetheart and girlfriend Mariko Yashida, who disappeared one year ago, has been taken to Tokyo by her father Shingen Yashida, the head of the Japanese crime syndicate Kuzuryu and a supplier of A.I.M., in order to be wed to Hideki Kurohagi. Wolverine goes on a quest to rescue Mariko and defeat Shingen and Hideki, encountering several opponents along the way. 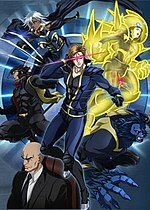 X-Men (エックスメン, Ekkusumen) (DVD title: X-Men: Animated Series) scheduled to air as the third show of the series with 12 episodes. It aired on Animax from April 1, 2011 to June 24, 2011. A preview trailer was released on February 18, 2011, featuring mutants such as Cyclops, Wolverine, Storm and Beast. It premiered in the United States on G4 on October 21, 2011. Jamie Simone as voice director, casting director, and reversion producer for the English version. The entire series was released on DVD in the United States on April 24, 2012. Following the death of Jean Grey (who was being controlled by the Dark Phoenix, due to the sinister influence of the Inner Circle), the X-Men are reassembled by Professor X to travel to Japan following the abduction of Armor and face the U-Men who are abducting young mutants in order to harvest their organs. During their fight with the U-Men, the X-Men discover that some of the mutants in Japan are suffering from the "Damon Hall Syndrome" which causes problems for mutants during their second mutation. The X-Men must also deal with the next plot of the Inner Circle. Blade (ブレイド, Bureido) is the fourth and final show of the series. Comprising twelve episodes like the others, the story is written by Kenta Fukasaku, son of the late Kinji Fukasaku. Jamie Simone served as casting director, reversion producer, and voice director for the English version where he was assisted by Mary Elizabeth McGlynn. It aired on Animax from July 1, 2011 to September 16, 2011. Blade is a "daywalker" vampire hunter who was born with human and vampire blood in his veins after a vampire attacked his mother. Blade is visiting Japan on a mission where he not only confronts Deacon Frost (the vampire who killed his mother Tara Brooks), but also goes up against a mysterious organization of vampires known as "Existence". Following the TV series, Madhouse animated different Marvel Anime films. The first was Iron Man: Rise of Technovore, a direct-to-video film directed by Hiroshi Hamasaki, which was released on April 16, 2013 in the United States. The second was Avengers Confidential: Black Widow & Punisher which was released on March 25, 2014 in the United States. Marvel characters were also in additional anime TV series. Marvel Disk Wars: The Avengers was produced by Walt Disney Japan and Toei Animation for TX Network in 2014. Marvel Future Avengers is a currently produced anime series. Future Avengers is an anime TV series produced by Walt Disney Japan and Madhouse for Dlife satellite channel based on Marvel Comics' Avengers characters. The series' main group is Makoto, Adi, Chloe, who has their genes mutated by Hydra, who become part of the Future Avengers, a team learning to fight villains alongside the Avengers. The series was announced in February 2017 for broadcast on Dlife channel during the middle of the year. Starting on February 28, 2017, Future Avengers would be a continuing magna series by Mizuno Teruaki in CoroCoro Comic Special published by Shogakkan. In May 2017, the Dlife show was announced to premiere on Saturday, July 22, 2017 with anime production by Madhouse. In January 2018, the series was renewed for another season starting mid-year. The second season debuted on July 30, 2018. The Inhumans are slated to appear this season. ^ "Iron Man, Wolverine in Marvel, Madhouse's 1st TV Anime (Updated)". Anime News Network. August 25, 2008. Retrieved December 29, 2008. ^ "Marvel to behold". C21 Media. July 6, 2010. Archived from the original on December 12, 2010. Retrieved July 6, 2010. ^ "Marvel Anime to Run on G4 in the United States". Anime News Network. July 23, 2010. Archived from the original on June 9, 2013. Retrieved July 24, 2010. ^ "SDCC: G4 Announces New Marvel Anime Series". Superhero Hype!. July 26, 2010. Retrieved July 26, 2010. ^ Gustines, George (August 24, 2008). "Superheroes to Be Recast for Japan". The New York Times. Retrieved April 1, 2011. ^ "Iron Man & Wolverine Coming To Sci Fi In August! : SCI FI PI//SCI FI Channel". 'Captain'. Archived from the original on September 29, 2011. Retrieved August 11, 2011. ^ a b "Anime Iron Man and Wolverine Premiere July 29". SuperheroHype.com. Retrieved June 23, 2011. ^ a b "G4 TV Schedule; Sat, July 23, 2011". G4 Media. Archived from the original on July 22, 2011. Retrieved July 22, 2011. ^ "Iron Man: Rise of Technovore Coming to Blu-ray 4/16 More on Marvel.com". MARVEL. Retrieved March 18, 2013. ^ "Madhouse, Marvel Team Up Again for New Iron Man: Rise of Technovore Film". Anime News Network. October 8, 2012. Retrieved October 9, 2012. ^ "News: X-Men Anime, Nichijou Promo Videos Streamed". Anime News Network. February 18, 2011. Retrieved February 20, 2011. ^ "'X-Men' Anime Debuts In October With Scott Porter As Cyclops". ^ "Blade English Dub's Lead Cast - Interest". Anime News Network. October 14, 2011. Retrieved April 29, 2013. ^ a b c d "New Japan original TV anime "Marvel Future Avengers" From the 22nd of July (Sat) the world's first broadcast!". Animate Times (in Japanese). May 30, 2017. Retrieved June 23, 2018. ^ a b "Marvel creates a new Japanese original TV anime "Marvel Future Avengers" produced! Broadcast this summer". Animate Times (in Japanese). animateLAB Corporation. February 27, 2017. Retrieved June 23, 2018. Translation. ^ "> news > animation > articles 'Marvel Future Avengers' New Season Production Decision! Start broadcasting this summer". Anime Anime (in Japanese). IID, Inc. January 20, 2018. Retrieved June 23, 2018. ^ ""Marvel Future Avengers" Season 2 broadcasts in July! Even the episode of In Humans". Anime Anime (in Japanese). IID, Inc. June 23, 2017. Retrieved June 23, 2018.